Keep your feet chic... and feel good while doing it! 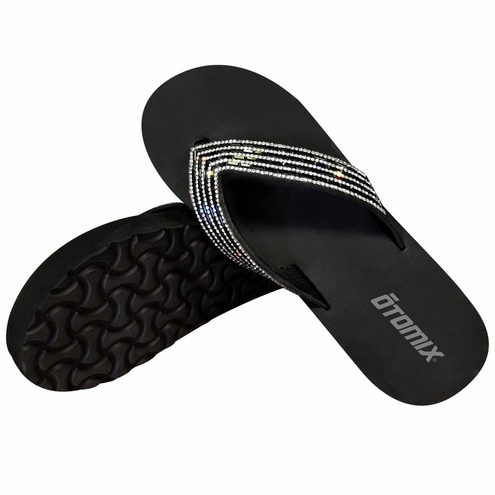 Whether you're in between competition stages, running around town or hanging by the pool, Otomix Lady's Competition Sandals will offer you a comfortable, slip-on feel that will treat your feet. Our soft and supportive foam footbeds will offer relief, while the upper thong sparkles with a rainbow of black and clear rhinestones. These NEW sandals will keep your feet chic. Toe is 2.5 inches. The heel is 4 inches. Flip-flop style with a patterned sole for reduced slipping.